The Emilie K. Asplundh Concert Hall is located in Philips Memorial Building, on the main campus. The Philips Memorial Building was opened in 1927 and was completely renovated from 1998 through 2000. I chose this building because it represented something complete different than the previous post, rather than the neoclassical style of the library, it represents Middle Age architecture. This building specifically represents, a much smaller version, of a medieval castle. Medieval architecture has a few specific characteristics all falling in the styles of gothic, romanesque, and pre-romanesque. Even though this castle doesn’t have a drawbridge or moat, it still shows the classic castle features such as towers, stone, and dramatic arches. 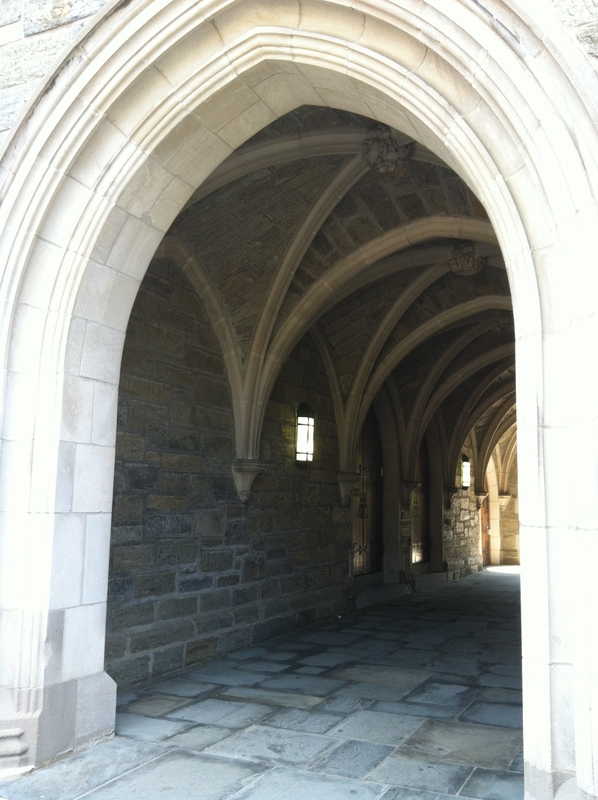 This arch welcomes you as you walk through a tunnel leading to part of the campus court yard. It represents the gothic style of ‘Lancet’ arches from beginning to end. The fun thing about this arch is that if you talk into the cut out section, and have someone else place their ear on the other side, it transfers the sound. 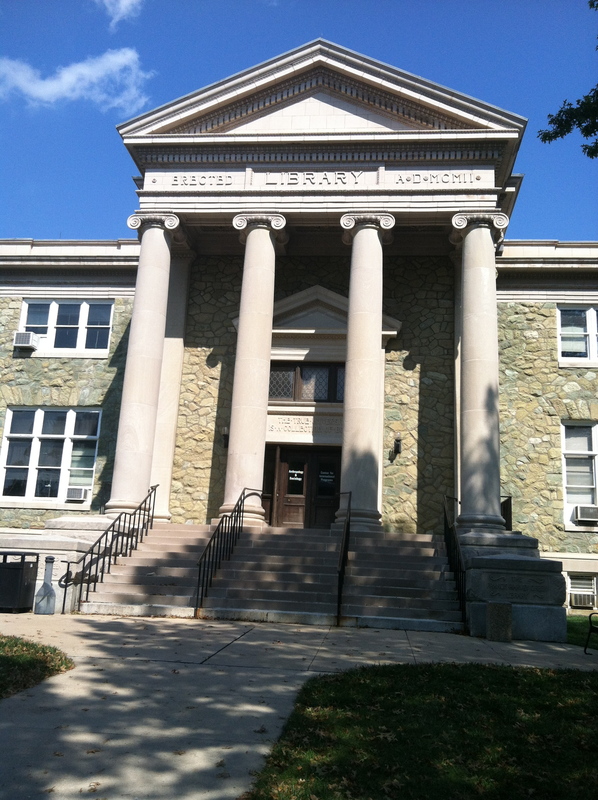 The Old Library was built in 1902, and was one of the main buildings which helped give West Chester the name, The Athens of the West by Philadelphia Magazine in 2001. Throughout the small town, neoclassical architecture is shown quite a lot. 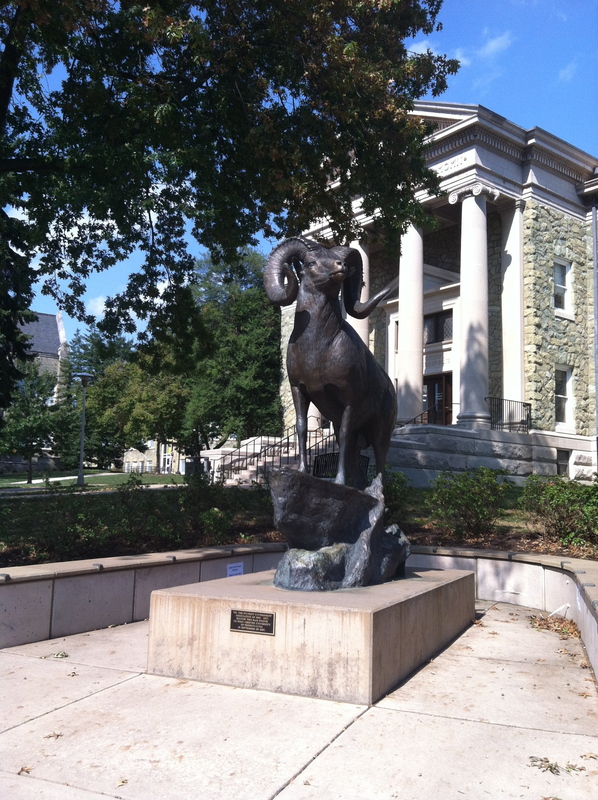 I was specifically focusing on campus buildings, but the neoclassical theme is shown throughout the entire town, with the: town courthouse, the Chester county bank building, the town ‘drinking fountain’, and the farmers and mechanics building. The Old Library demonstrates a classic theme in architecture, neoclassical. Neoclassical generally was inspired by the architecture of ancient Rome and ancient Greece. Most of the time, neoclassical architecture will feature tall and ornate columns, triangular pediment, a domed roof and symmetrical shape. 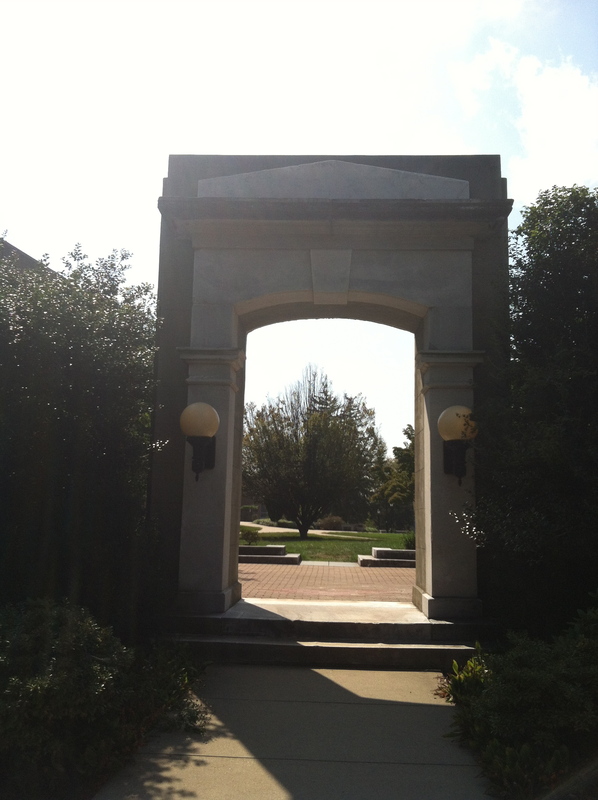 This arch is a memorial to the Old Main Building which was once a long standing part of West Chester University’s Campus. The building was built in 1871 and served as a principal dormitory and classroom facility. 100 years later in 1971, the Old Main Building was facing a facility upgrade, that would cost the university a fortune, and the building was torn down. The building was loved by the university and the local community, so as part of the university’s centennial celebration, I committee was formed to honor the historic building by attempting to reassemble part of its original components. The buildings stone entrance way arch and marble steps were recovered and reused in this memorial structure, which was constructed in 1997. 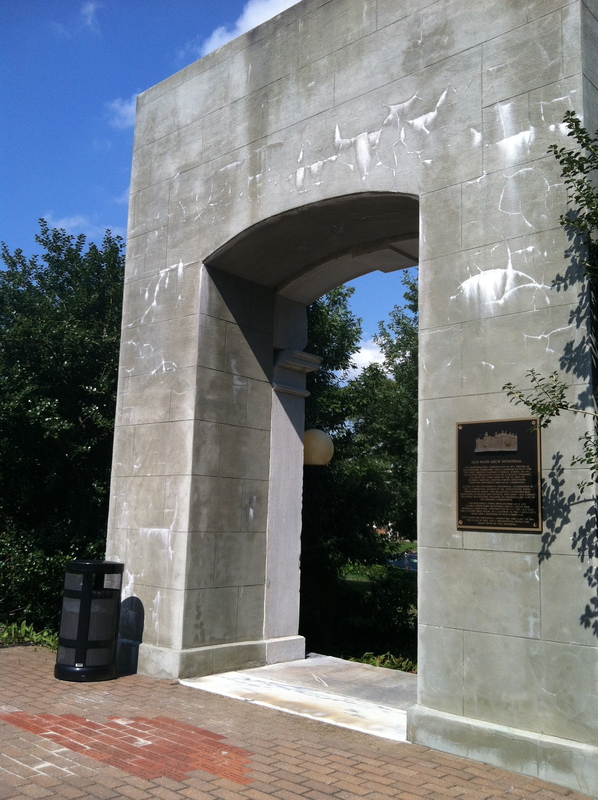 The Old Main arch stands, once as it did before, as a gateway to the university’s quad and a reminder of West Chester University’s heritage. 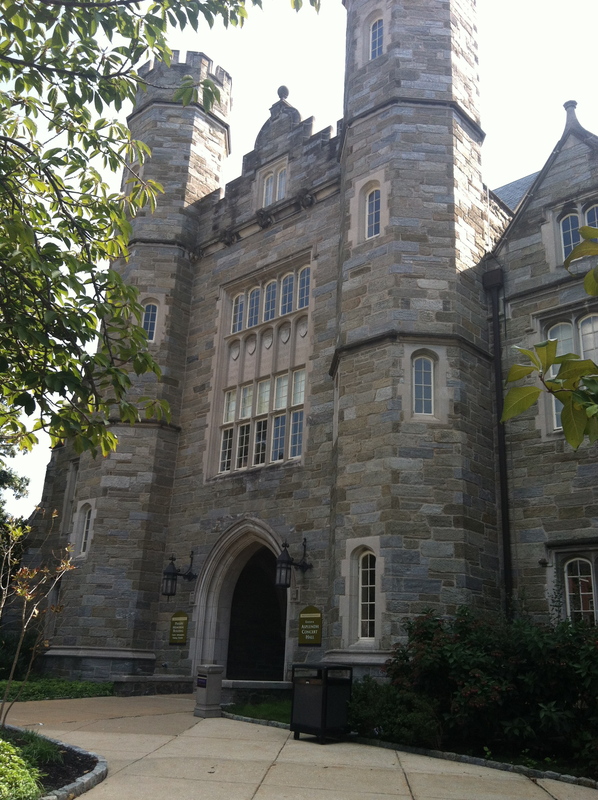 My boyfriend attends West Chester University, so I visit there often. West Chester is a beautiful little town in the PA’s Brandywine Valley. After a recent visit to the south part of campus, which is away from the downtown area, I noticed a beautiful large hilled landscape off to the distance, and never had noticed this before, even after numerous class drop offs. The downtown section of West Chester offers historic architectural value that dates back to the 1700’s. West Chester is listed on the National Register of historical places and has architecture influenced by greek revival and colonial inspirations, actually being nick named ‘The Athens of the West ‘. I am actually now very excited after doing a little research about the town to really begin to appreciate the area I visit every other weekend.